I don’t remember much of this weekend. I know there was rain, a headache, a call to mom, and lots of sleep. I was probably awake for a cumulative 10 hours Saturday and Sunday. I have no idea what caused that 56-hour bug, but it left me better than it found me. Not to get all Sound of Music on you, but life was pretty good today. Nothing extraordinary happened, I just had one of those days where I realized how good I have it. Don’t get me wrong, life isn’t perfect, but it’s pretty damn good, especially when it’s cherry season. This part of Italy is known for cherries, and they really are worth talking about. The ladies at the local cherry stand sell one kilogram baskets, but I can take down a kilogram of cherries in one sitting. So today I asked for the whole crate. They looked at each other and one of them asked me if I seriously wanted seven kilograms (about 15.5 pounds) of cherries. Immediately after I took this picture I sat at my outside table with my feet up and ate cherries until my stomach hurt. This weekend was not one for the record books, but as Monday’s go, this one was pretty fantastic. There is a whole Cherry Festival in Marostica, you should go! those cherries look amazing!!!! i want some! I still have about 12 pounds left, come to Italy and you are welcome to them! italy? i am so there!!!!!!!!!!! 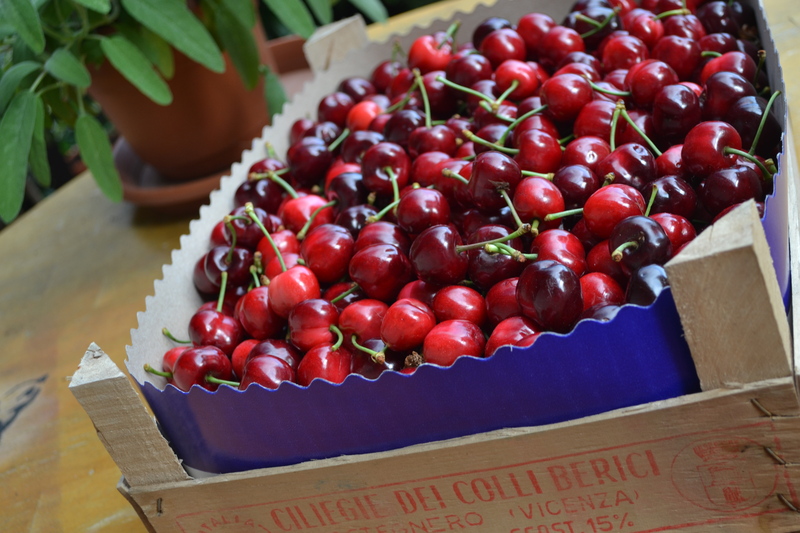 They are so good…there will be a festival in Castegnero in a few weeks too, another area ripe with cherries. Yummy!